Not to worry. I'm not talking about a real turtle, but bread shaped like a turtle. This is so much fun to do with kids. And it's so yummy. We gobble this bread up whenever I make it with my nephews. 1. Mix 1 ½ cups of flour with the yeast, sugar and salt in a large bowl. 2. Heat water, milk and butter in a sauce pan. Stir in yeast/flour mixture. 3. Add egg and remaining flour until the dough is easy to handle. 4. Dust a clean surface with flour. Knead dough until smooth and elastic (5 minutes). 5. Cover and rest for 10 minutes. 7. Shape a 2-inch piece of dough into a ball for a head. Shape 4 smaller pieces into balls for feet. Shape 1 piece of dough into a tail. 8. Shape the rest of the bowl into a ball for the body. Place on cookie sheet and flatter slightly. 9. Attach the head, feet and tail by flattening an edge of the ball under the body to secure it. 10. Cover and let rise for 20 minutes. Heat the oven to 400 degrees. 11. Make crisscross cut marks with a knife across the body about ¼ inch deep so it looks like a turtle’s shell. 12. Bake until golden brown 20-25 minutes. Cool then enjoy! 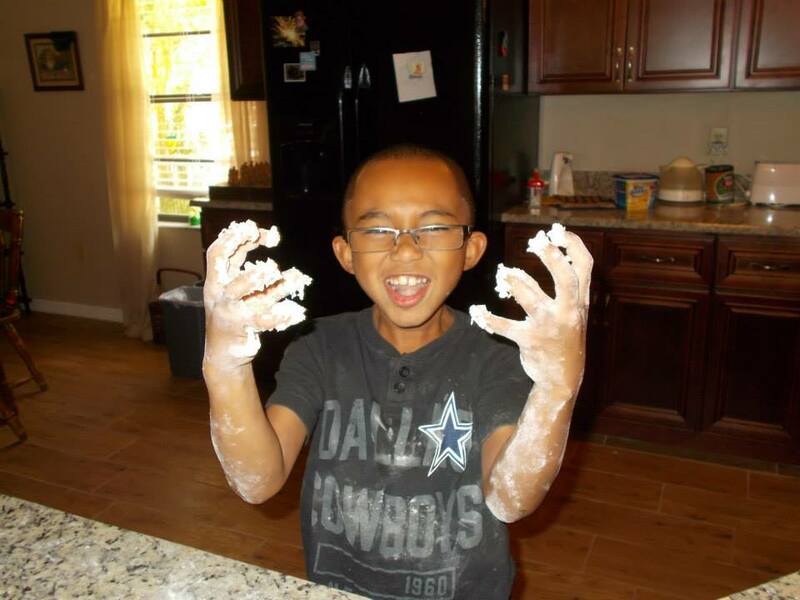 My youngest nephew LOVES to play with flour. 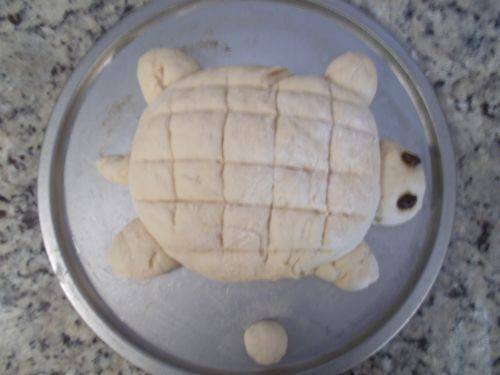 QUESTIONS: Would you try Turtle Bread? What's your favorite bread to bake? I also love to make banana bread. Banana bread is one of my favorites to make. And so easy. That is so cute! 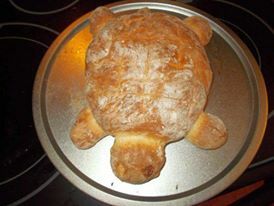 I'd totally try the turtle bread. My household likes banana bread too. And zucchini bread. And ice cream. Oh, wait! Got a little off topic there. :) Have a great weekend! I've never made zucchini bread but I've been wanting to for a long time. How cute! One could make all sorts of animals. haha that sure is neat indeed. He loves his flour too. Thanks for sharing what looks like a wonderful recipe. This is delightful! I'm sure my Captain Awesome will love making this - he's a fan of flour too ;-) Benson, my walking-rock turned world traveler (fugitive desert tortoise) would certainly approve! I've made teddy bear bread which is similar, and cinnamon bread, both of which use yeast and taste like bread, as opposed to being sweet. Banana and zucchini bread are quick breads as they don't use yeast. They are two different textures. Kids love baking, though, and most of them like getting their hands into batter no matter what they are making. Kudos to you for baking with your nephews! Aw. Teddy Bear bread. That sounds so cute! That's so cute! When I read the title, I thought it was going to be a chocolate bread with caramel and pecans. I have a wicked lavender bread recipe I love, and a lime-coconut banana bread that's delicious. A chocolate bread with caramel and pecans sounds good. Lavender bread? Oh my gosh. I need to try that! What fun! I'll have to remember this the next time my grandkids come for a visit. Fun recipe! I would make this in the winter. It's too hot here right now to bake LOL. Thanks for sharing this, Chrys! I know just what you mean about it being too HOT. I've never baked bread. I'd be willing to give that a try. Good for you for baking with the youngsters. My children loved kneading bread dough with me. That was a long time ago. Your nephew is priceless and I'm glad to see a male helping with the baking. More of that please. The Turtle Bread was cute. I love that idea and the bread is so cute. It looks like so much fun. I'm keeping the project in my little book of things to do with the grandchildren.